INDIVIDUAL EXPERIMENTAL DATA. With a Calan Broadbent Feeding System researchers can prescribe, control and document the feed intake of each animal in a common trial pen. Without restricting animals. Without experimental bias. GROUP HOUSING AND INDIVIDUAL FEEDING. Each animal in the trial pen is statistically valued as a single experimental unit. Data comparing individual responses to treatment of animals housed together are superior to data comparing aggregate responses of different pens. Trials require fewer animals. Less space, less penning, less feed. And less work. INDIVIDUAL ELECTRONIC RECOGNITION & FEED SECURITY. The feed door circuit board (A) transmits an electrical signal. 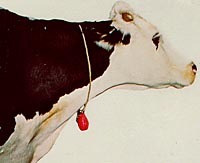 The animal sensor key (B) which recognizes the signal unlocks the feed door (C). The animal pushes open the door and feeds. The narrow feed barrier (D) opening prevents penmates from stealing rations. One door, one key. One animal, one ration. A solid-state circuit board (A) mounted on the door controls the locking bolt and transmits a silent electronic signal. The door unlocks only when activated by a sensor key tuned to the same frequency. The key (B) hangs from a neck cord. The close proximity of the sensor key to the animal's head prevents the locking mechanism from triggering open before the animal is in feeding position, thus preventing a penmate from boring into the feed bunk. The molded fiberglass door (C) is shaped to ease animal acceptance. Once unlocked, the angled door opens quickly with minimal effort. The animal's unrestricted view of surroundings, food and penmates encourages relaxed, natural feeding. The spring-loaded door instantly closes and locks when the animal withdraws from the feed trough. The unique feed barrier design (D) is an integral part of the system. Besides supporting the doors, it separates pen from trough and prevents animals from stealing each other's ration. As the animal's head comes down through the barrier toward its feed, the narrow entryway guides the sensor key to the electronically active section of the door. Successful electronic recognition is assured and the door opens, positively reinforcing an animal's confidence in the system. The door and barrier work together to keep feed from spilling into the pen or from jamming the system. Barriers are constructed on-site by the user, according to plans and material specifications supplied with the system. Or American Calan can provide custom feed barriers as part of a system installation. Doors are shockproof. Operating on a safe 24 volts, power is supplied from a transformer which reduces standard electrical current to the required level. The keys do not require power. Engineered for an animal environment, gate components, keys and barriers are virtually maintenance-free. While most applications are indoors, the system can be used outside. However, for the overall success of the trial, feed should be sheltered from moisture. Only basic mechanical skills are required to operate the Calan Broadbent Feeding System. The system works with all types of feeds, wet or dry, including forages, concentrates or mixtures. Rations can be dispensed on an ad libitum, limited intake or maintenance basis. Although originally designed for dairy and beef cattle, the system has been successfully adapted for goats, sheep and swine. To assure the complete integrity of the feed trial, doors should be used with properly designed feed bunks. Calan Test-Tubs, Fiberglass ration containers engineered for research purposes, are recommended. Or equipment plans for constructing feed bunks on-site are available from American Calan . Precise feed and data management is further achieved by the Data Ranger, a computer-equipped machine that calculates, weighs, mixes, dispenses and weighs-back rations, keeping a complete data record for each animal. During the past decade, the Calan Broadbent Feeding System has become a universally accepted method of managing research animals. Whether used for experimental programs with 600 animals or for an isolated feeding trial with 12 animals, individual feeding makes every animal a productive research unit. In terms of research quality, cost and satisfaction, thousands of applications around the world in institutions large and small have affirmed the effectiveness of the approach and reliability of the equipment.